I didn’t write this essay to get attention. I wrote it because I wanted to start writing more. Not for clients, but for my own enjoyment. After exploring blog platforms of all sorts, it suddenly occurred to me that the platform wouldn’t make a damn bit of difference without something to post. 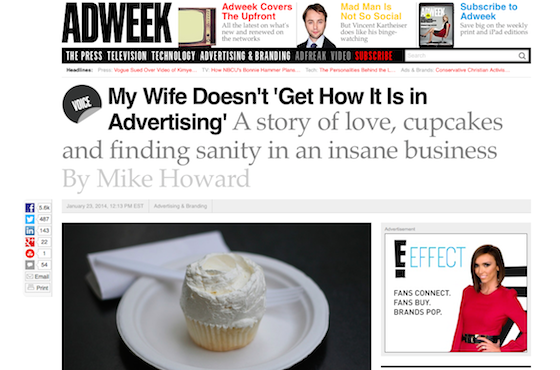 So I spent a few days writing this true story about cupcakes, love, career goals, and finding happiness. I posted the original on Medium, and my wife really loved it, so, on a whim, I posted the link on Facebook, where lots of friends liked it and shared it and tweeted it themselves. Adweek tweeted me late that evening and asked if they could run it online, and once they did, it kinda took off. On Medium, it’s received about 27K views, and was among their top 100 most-read posts for January 2014. On Adweek.com, it received 5.6K re-posts to Facebook, it was tweeted 487 times, and spent a solid week as the most viewed article. I even got a spot on Huffington Post Live where I got the chance to babble about it some more. If you actually care enough to click through the link below and watch the rest of the interview (If you are my mom, for example), it picks up again at about 16:30 on the HuffPost site.